image builds : ..the cat came back.. Some of you may have noticed that that Neo1973 device names have changed from fic-gta01 and fic-gta02 to om-gta01 and om-gta02 in openembedded. Some of you may have missed this and its implications. Essentially all references to fic-gta* have been changed so your old images will try, for example, to grab updates from the fic-gta folders of buildhosts and will probaly fail. While this might be a little annoying now, changing the device names in the future would have probably been much more of a nightmare. I have decided to move my original OM-2007.2 directory to OLD-OM2007.2-FIC so that you can still get old files if you run older images. The OM-2007.2 directory on my buildhost will now be for om-gta0* images and packages. Mickey Lauer recently told us about some interesting developments presented at FOSDEM. More work has taken place and images can now be built – so as always that’s what I’m going to do. I’ll add this to my regular building regime – although the rate of change in this image will probably be a little slower than the main Openmoko and ScaredyCat images . The first one has already been uploaded to my buildhost so you can test it out for yourself right now. Please remember that although it works and you can make and receive calls this is experimental stuff. As long as you bear this in mind everyone will be happy. There’s an awful lot of work gone into this by emdete (irc nick) for which he should be congratulated. Not only is it a working prototype but he has been thinking outside the box – more of this is needed for new opensource devices to make it in the marketplace. I’ve chatted to emdete on irc and he is aware of some of the shortcomings of this first release. Primarily he was keen to get a working version to demonstrate at FOSDEM, which makes sense. In the future we can look forward to a more modular approach and of course, for those of us who don’t speak German, localization. These new images also serve as a test-bed for Mickey Lauer’s gsm mux daemon which, wonderfully, has a dbus interface, something I really would like to see in all the daemons in Openmoko. I’d noticed that one of the developers had added a dependency on gpsd to the image build. Unfortunately gpsd depends on python-ncurses when you use –python in the build. While I’m sure they tested first, there is no .bb for python-ncurses in oe dev. Since this is preventing me building I am removing the dependency on gpsd from my builds. This allows me to build as normal. It is also preventing the build of gpsd but older versions should still work. This should only affect people who build from oe dev and not the om version and should be fixed at some point. Although I am unsure as to why Openmoko is depending on gpsd anyway, at least at this stage. 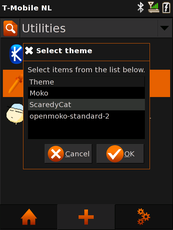 Lorn Potter from Trolltech dropped a note into the Openmoko community list to let everyone know that Qtopia can now use the fully GPL’d Cruxus media engine in their Qtopia builds. This is another step forward and away from Helix, which was basically holding Qtopia back in terms of a GPL phone stack. Now all I have to do is get it working properly, once it is I’ll be adding it to my builds. Stay tuned.